Happy new year everyone! Hope you all had a good one! I've decided to give up my baking blog, i've been thinking of it for a while now and as it's a new year and new start etc i think now is the perfect time! Thank you so much to everyone for all your lovely comments and support over the past two years; you've all been lovely - i will of course still be reading your blogs and i will still be baking from time to time but i'm going to focus on my career and i've decided to take up some new hobbies running and knitting! So farewell, so long and see you around! Mrs B! This is a Flickr badge showing public photos from MrsBsBaking. Make your own badge here. All rights reserved/Mrs B's Baking. 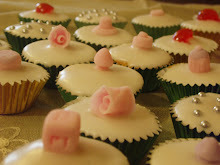 You may not copy or reproduce any parts of this blog without the consent of Mrs B's Baking.